Home Building in Canada's Log Cabins, Second Edition. 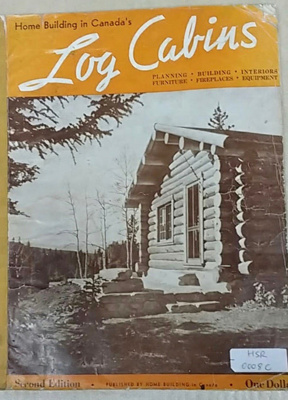 Published by Home Building in Canada, Toronto, 1946. Cost: One Dollar. "Planning; Building; Interiors; Furniture; Fireplaces; Equipment". A handwritten inscription on the front page reads "L Lines + W. Steves, Hooson Road, Pender Island, BC".